What would you do, if at eighteen, you just get married to a man you hardly know? To a man who isn’t around? Nella Oortman is faced with those questions and more. When her husband finally returns from sea, he gives her the strangest wedding gift–a miniature replica of their house. Once a miniaturist is sought out to make the furniture, it is then secrets start to tally up. How does the miniaturist know? How does he or she predict these things? 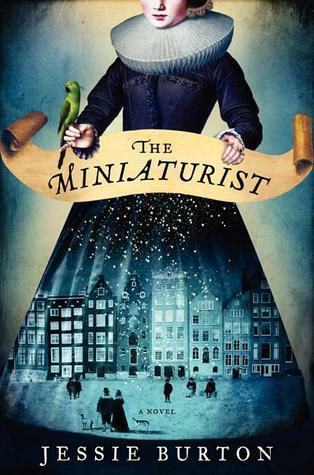 Taking place within three months in 1686 Amsterdam, The Miniaturist takes a deep look at what it was like for the working to high middle class at the time. Full of secrets, twists, and back-stabbing intrigue, this debut is not to be missed. Nella starts off as a small voiced, scared newlywed who is afraid of her older, much more out spoken sister in law Marin. With brilliant character development, and a more brilliant twist, the reader is taken on a surprise journey with these two women. Not to mention how the marriage goes! This book is full of plot twists that take you aback. You won’t expect a single thing that happens, which makes this book ever more engaging and fun to read. Burton’s writing is fresh, imaginative, and daring. With one of her plot twists, she goes there. Really, really goes there where most authors, established or not, would be hesitant or afraid to. But, not Burton. She takes it to the unexpected, especially for that time period. The way she did it was highly successful in my opinion. I was shocked, surprised, and not at all in disagreement with her choice. I was impressed with what she did, actually. That wasn’t the only plot twist where she pushed the envelope, either. She wrote one more thing, where in today’s time would not be too big of a controversy, but in 1686, big big big controversy. And, it worked! It wasn’t put in the story just to push our limits. It made complete sense. I loved this book. I loved everything about it. The plot twists impressed me. The writing was astonishingly good for a first time author. The characters developed perfectly. The end was nicely open ended for the readers. There wasn’t a thing I could complain about. I was completely invested. It was hard not to be. The first page alone pulls you in by starting with a funeral for someone who apparently has no friends. You have to think who it is for. It’s that good. It pulls you in that fast. I’m going to say it. This book was one of my favorite reads of this year. It was that good. I can’t recommend it enough. It will pull you in; leave you wanting more. If there is one historical fiction novel you read this year, I honestly think this is the one you should read. It isn’t about Kings or Queens. Treason and the like. It is about people like us. Finally, a historical fiction novel we can relate to!